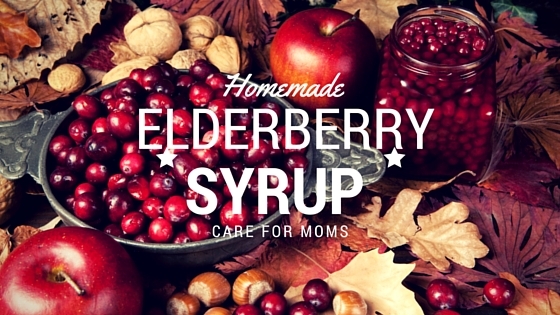 Home » Blog » Elderberry Syrup Recipe to Prevent Cold & Flu! Elderberry Syrup Recipe to Prevent Cold & Flu! Elderberry has been used for centuries to treat wounds and respiratory illnesses such as cold and flu. Evidence suggests that chemicals in elder flower and berries work to reduce swelling in mucous membranes, such as the sinuses, as well as help to relieve nasal congestion. Elderberries may also have anti-inflammatory, antiviral, and anticancer properties. The Elderberry also contains flavonoids, which have antioxidant properties and may help prevent cellular damage. But of course (as is common with inexpensive remedies) very few studies have been done in humans, so researchers don’t know how effective Elderberry truly may be….so we must rely on centuries worth of reliance on this powerful berry. It is believed that Elderberry’s mode of action treats cold and flu symptoms by reducing congestion. One study found that taking elderberry extract could shorten the duration of flu by about 3 days! Another preliminary study found that taking elderberry extract within 24 hours of first symptoms helped reduce flu (source). Note: this makes a gigantic batch (3 quarts worth!) & needs to be stored in refrigerator or freezer (once cooled). You can also do what I do and share the love…or simply cut the recipe in half. Add the dried elderberries, ginger, cinnamon sticks, cloves, and cranberries to a large stock pot. Simmer for an hour with the lid cracked. After an hour, uncover and let cool on the stove until it stops steaming. Pull out the solids (ginger, cinnamon sticks and cloves) and discard. Strain the liquid into a large bowl. Press the berries around in the strainer to get as much juice out of them as you can (I use a large metal spoon but I still end up with stained fingers so you may want to wear some rubber or disposable gloves). You can also squeeze the berries through cheesecloth. When finished, discard the berry pulp. Once the liquid drops to 110 degrees F or less, add your raw honey and whisk, making sure to break up any little clusters of honey. Bottle and refrigerate (I use a couple quart size jars for storing and then a few smaller glass bottles to keep in my refrigerator for daily use such as these. Have you ever used Elderberry syrup? Please share your experience!